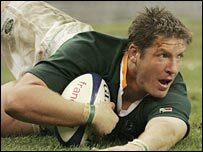 Lock Bakkies Botha and centre Jean de Villiers have been ruled out of South Africa's Tri-Nations squad after failing to recover from injuries. Botha is still recovering from a calf problem while De Villiers picked up a rib injury during last month's first Test against Scotland. But winger Bryan Habana has overcome a rib injury. South Africa's first match in the Tri-Nations series will be against Australia in Brisbane on 15 July. De Villiers will not be replaced in the squad but a decision on Botha's replacement will be made on Thursday. The Tri-Nations begins on Saturday when New Zealand host Australia in Christchurch.